AVANTE International Technology, Inc. has developed a patent pending system that can be implemented quickly and independent of the proposed PTC solution. AVANTE’s Positive Train Control System meets FRA requirements for PTC systems and is designed to provide a supplementary system that can be implemented in weeks or months with far less capital investment. Princeton Junction, NJ, February 13, 2018 --(PR.com)-- Recent rail accidents can be attributed to the lack of visibility or inability to know there were parked trains or vehicles on an unexpected track or crossing respectively in advance before the train can be stopped. Other well-known examples of avoidable train accidents in the last few years are more attributed to train engineers’ human errors. 1) The 2017 derailing of a high speed train in Washington State, traveling at 78 miles per hour. 50 miles per hour over the speed limit, when the incident happened. Three passengers killed and 62 passengers and crew injured. 2) The 2015 derailing of a train near Philadelphia. Of the 238 passengers and 5 crew, 8 were killed and over 200 injured. The train traveling at 102 mph in a 50 mph zone of curved tracks when it derailed. Train professionals and operators agree that such accidents would not have happened if the proposed and overdue automatic train control (ATC) system or positive train control (PTC) system were in place on those trains. That is, the PTC system would know when trains are travelling at speeds which are restricted and would provide advanced warning if actions are not taken by the train engineers. The ATC system would automatically engage and slow the train down before an accident occurs. However, PTC systems require extensive and expensive trackside communication and equipment infrastructure updating and interfere with daily train operations. Limited Federal funding for the implementation of the over $20 billion infrastructure updating, caused the proposed PTC implementation deadlines being extended several times. - Now, let us imagine an onboard train alerting system that can be implemented without stopping train operation on the tracks and trains that are being installed. - Imagine the complete Class 1 rail system of over 140,000 miles equipped with locators every 1/2 to 1/4 km providing visibility to both central command and trains that are affected within 3 to 6 months with less than a US$1 billion investment. - Imagine a train alerting system which controls and alerts, when a train has passed the position that will hit the bumper block before hitting it. - Imagine a train alerting system onboard of the train which exercises control of the train if the train does not have authorization to leave a siding. - Imagine also the quick to install train alerting system exercising direct and timely control of train movements when actions are not taken after alerting of violations without waiting for central command to respond. AVANTE’s PTC system would not require the use of trackside communication or any communication from central command to exercise automatic train control. The rail position locator and block identifies where the train is traveling, being read by a sensor and fed into an onboard AVANTE alerting system which interfaces with the automatic train control (ATC) system if available. If the train does not have ATC, AVANTE’s PTC included function of ATC exercises an alert and follows up with automatic control to slow the train down if required. The RF identifiers of the rail blocks are concealed underground in the middle of the track and can be sensed and read at a distance above the ground by a monitoring reader mounted under the train car. The geo-tagged position of the locating event is also sent to central command in real-time via existing infrastructure of cellular networks and fail-over to satellite communications to ensure fail safe communication. 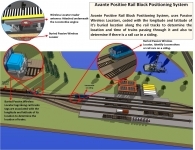 AVANTE’s patented and patent-pending PTC technologies are designed to provide redundant system control to the proposed PTC systems as a supplementary system and thus totally independent of the proposed infrastructure. The simplicity of the installation can be implemented as standalone system that can carry out PTC functions in a matter of weeks. The functioning of the system does not have to wait for extensive infrastructure of underground fiber-optic links and other trackside infrastructure. About AVANTE International Technology, Inc.
AVANTE International Technology, Inc., headquartered in Princeton Junction, NJ with over 20 years of innovations in providing system security and safety protection for facilities, assets and people. 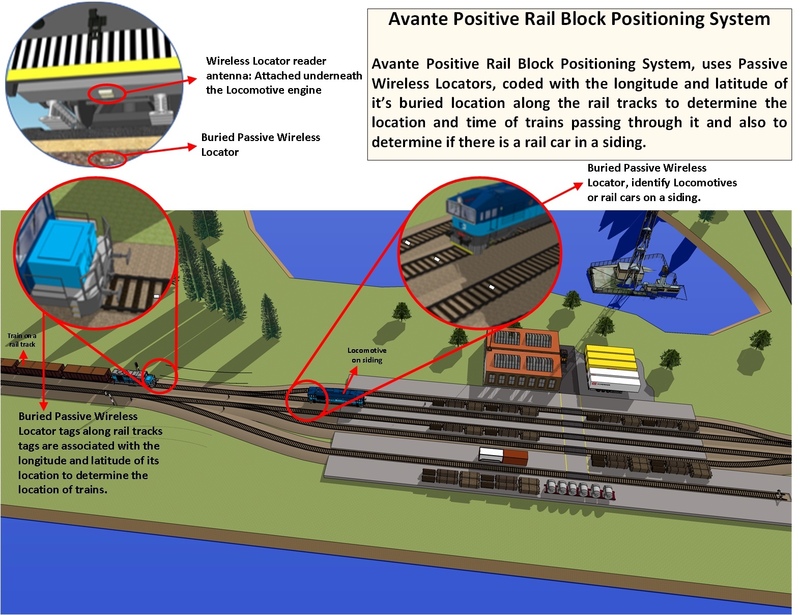 AVANTE’s patented positive train control system (US 9,434,397; and other pending patents) are designed to cost effectively achieve train operation safety. For information, contact Jeffery Douglass: Jdouglass@avantetech.com or 609-799-8896 x129. Click here to view the list of recent Press Releases from AVANTE International Technology, Inc.